1 Brisket (2 to 5 lbs) Try to find a cut that has a nice thick layer of fat on one side, no joke! Mix ingredients from sea salt to black pepper in a small bowl. This is the magic spice that makes just about anything taste good so feel free to double or triple the recipe to have extra for tomorrow night's tuna or salmon steaks. Line an 11x17 pyrex or casserole dish with one large oven bag. Place the rinsed and dried brisket in the bag. Rub the spice rub on both sides of meat and place the meat with the fat side facing up. If there is room you can throw in some small red potatoes and sliced carrots and onions if you want to have a full meal in the bag. But sometime the brisket is just too big for extra veggies. Tie off the bag and cut 6 small slits in the top. 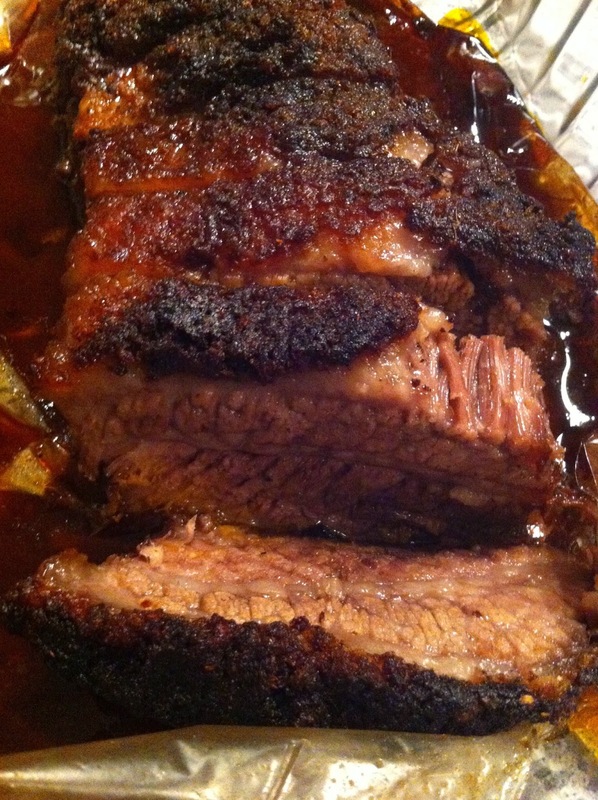 Bake at 325 deg F for 2.5 to 3 hours for a 2-3 lb brisket or 3 to 3.5 hours for a 3-5 lb brisket. The longer you cook the better....don't rush this one otherwise the meat will not be tender enough! Slice and serve hot with your favorite veggie. This can be prepared the night before and placed in the refrigerator until you are ready to cook it. The longer the spice rub marinates the meat, the better! This dinner is super good folks. One of my favorites. Make sure you keep all the juice that collects in the bag and pour it back over the meat. It's basically liquified fat so it's not exactly good for you but it is delicious. And that spice rub is incredible. Good on just about any kind of meat or fish.